National leaders have the ultimate responsibility to balance the needs of a diverse set of constituents in society while using their country’s unique set of resources to grow the economy and to gain comparative advantages. Salient to many observers, the United States of America, the world’s largest economy, has never had a female president or vice president and has had only forty-four women serve in the 224-year history of the U.S. Senate. Moreover, if women do make it into top-ranked government leadership positions, whether or not they perform notably different from their male counterparts still remains unknown. Though studies presented by several psychologists validate that women’s leadership styles differ from their male counterparts (i.e., more democratic, inclusive, participative and transformative), how this plays out nationally and in terms of setting national policy agendas and making key decisions for society is explained only anecdotally. For example, Ellen Johnson Sirleaf, affectionately known to her countrymen as the “Iron Lady,” was said to bring a “motherly sensitivity” to her post-war torn country, Liberia; Michelle Bachelet, the Republic of Chile’s first female national leader, won in 2006 on a campaign championing “gender equality” and “inclusion;” and most recently, Park Geun-hye won the presidential election in the Republic of Korea under the political platform of “disarming vicious cycles of distrust and building peace” with the Democratic People's Republic of Korea. These anecdotes all suggest an association with a gender-specific perception of governance, as well as a gender-specific expectation for substantive policy changes with a female taking the lead at the national level. To develop a better understanding of the unique contributions of female national leaders, this article uses global cross-national comparative leader data from 188 countries to explore the following questions: 1) How have global trends of national female leadership changed over time? and 2) Is there evidence that having a female—as compared to a male—leader has differential consequences for economic growth as ethnic diversity increases? Global trends of national female leadership: What has changed over time? Early civilizations have had no shortage of great women leaders of dynasties, empires and tribes, such as Cleopatra of Egypt and Julia Augusta of the Roman Empire. The legacy of women in national leadership continued through the 1800s, which featured queens at the helm of burgeoning sovereign states. However, in the recent era of democratization, with the introduction of representative government and equal voting rights, there has been a dearth of female national leaders. Not until 1969 was the first female elected as Prime Minister (Golda Meir of Israel) in the wake of the death of her predecessor. It took yet another decade for the second woman to be elected to lead her country as Prime Minister (Margaret Thatcher of the United Kingdom). The probability of a woman reaching the top leadership ranks of society is slim—less than 5 percent of the national leaders across the 188 countries we examined since the 1950s have been female. Given how few women have risen to these national leadership positions over time, our interest here is to document if and how this trend has changed over time. We shall then further explore (in question 2) whether women’s attainment of leadership is associated with differential economic outcomes depending on the level of ethnic diversity in the country. We first examined data on national leaders to see which nations have or have had female representation in that category. To satisfy this inquiry, we compiled national leader data from two key datasets—Archigos and The Worldwide Guide to Women in Leadership—to examine 1,338 national leaders that cumulatively ruled over 10,340 leader-years in 188 nations from 1950 to 2004. We used these data to research the patterns of women’s presence in national leadership positions—as queens, presidents or prime ministers. Fifty-four of the 188 countries had at least one female national leader between 1950 and 2004. Of the 1,338 total national leaders in this fifty-five year period, less than 5 percent (sixty-one leaders) were women, including thirteen queens, eighteen presidents and thirty prime ministers (see Table 1 below for the full list). 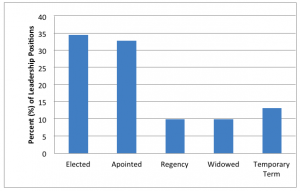 While the majority of these women were either elected or appointed to their positions (67 percent), a high percentage of these women (33 percent) came into power through regency, death of a spouse or temporary appointments (Figure 1). The first female national leader that did not come into power by regency (i.e., queens) is Sirimavo Bandaranaike, the Prime Minister of Sri Lanka, who assumed leadership in 1960 in the wake of her husband’s (Prime Minister Solomon Bandaranaike) assassination and his likely successor’s illness. The number of female national leaders in a given year quadrupled since the early 1950s, growing from four queens in 1950 to eighteen female leaders (with a growing representation of elected prime ministers and presidents) in 2004 (Figure 2). This suggests that as countries democratize and citizens are given more choice in selecting a leader, more female national leaders may be elected. A disproportionate amount of female national leader-year periods are in developed, as compared to less developed, nations (p<.001). The sum of female-led years is also significantly underrepresented in the least developed nations (Table 2). Only about 1 percent of leader-year periods in least developed nations (e.g., Haiti, Mozambique, Liberia and Senegal) have been female led, 2 percent in developing nations (e.g., China, India, the Philippines and Sri Lanka) and slightly more than 4 percent in developed nations (e.g., Finland, Israel, New Zealand and the United Kingdom). This suggests that with development and time, countries have been increasingly open to having women leaders, yet there is still a dearth of female leaders at the national level, representing a total of 2.22 percent of the total leader-years for all presidents, prime ministers and regents up to the year 2004. While these descriptive statistics account for women’s global presence in national leadership roles, we make no claims on how these few female national leaders rose to the top, leaving this issue for future research to resolve. Next, we more specifically examined country-level performance outcomes given the diversity of the country context and the gender of the leader. The top national leadership positions of a country (e.g., queen or king, president and prime minister) are highly powerful roles affording the possessor the power to shape policies and agendas that have a significant influence on country-level outcomes. More recently, scholars have identified linkages between gross domestic product (GDP) growth and the crucial role the national leader plays in the growth of his or her nation. For example, in Jones and Olken’s “Do Leaders Matter?,” they showed that differences in Mao’s versus Deng’s politics, public policies and fiscal policies are directly associated with China’s growth trajectory during each leader’s era. China’s GDP experienced slow growth at 1.7 percent per year under Mao’s leadership with policies such as the Cultural Revolution. Comparatively, Deng’s national leadership agenda, which included more progressive, market-oriented policies, experienced growth rates of 5.9 percent on average in each subsequent year. This research suggests that the policy agendas that leaders establish are associated with the overall growth trajectory of their nation. If this is the case, that leaders do in fact influence economies, do female national leaders affect their nations differently than their male counterparts? Does the gender of the national leader matter? To examine whether a leader’s gender affects societal outcomes, we analyzed an economic indicator that could potentially benefit from having a leader with traits such as inclusiveness, democratic diplomacy and a transformational style—all characteristics that are stereotypically female leadership traits. An economic indicator particularly important in capturing the complexity of societal inclusion is the level of ethnic diversity in the country, more commonly known in the economic development literature as ethnic fractionalization (or ethnic diversity by political scientists). Ethnic fractionalization (EF) reflects the number of ethnic groups within a country and the probability that a fellow countryman is of another ethnic group. The conventional measurement of EF is the likelihood that two people chosen at random in a given society will be from different ethnic groups. Development economists and political scientists have shown that more ethnically heterogeneous societies suffer from a lack of inclusion, more inequalities and greater conflict among ethnic groups. Some nations face more complexity when it comes to developing cohesion, maintaining inclusion and managing issues associated with high levels of diversity. For example, ethnic diversity ranges considerably from nations with a relatively homogeneous majority (e.g., Australia, EF=0.09) to more ethnically heterogeneous societies (e.g., Liberia, EF=0.91). The United States has an EF score of 0.49, being slightly above the global mean (EF=0.43). EF ranges from 0 to 1; 1 standard deviation above mean=0.69; 1 stand deviation below mean=0.18) (Figure 3). Development economists have repeatedly shown that high levels of ethnic diversity are inversely correlated with GPD growth. A one unit increase in ethnic diversity in a country—a transition from complete homogeneity to high diversity—is associated with 2 percent negative GDP growth. While this finding may be a surprise to some, recent research has shown that more ethnic diversity in societies adds complexity to governing due to conflicts of interest between ethnic groups, less inclusiveness among the non-governing ethnic groups and policy failure leading to underdevelopment. Collier’s most recent research has shown that unshared leadership in highly ethnically diverse settings can lead to more conflict and the increased risk of a political coup d’état. To compare the performance outcomes among national leaders, our research design required longitudinal performance data that can be mapped onto distinct leadership regimes. To precisely link the two, we used annual Penn World Table GDP growth data for the subsequent year (GDP growth year +1). Leader performance was matched to the subsequent GDP growth year to avoid performance attribution errors during the years the leader transitions in and out of office. We followed the longstanding tradition of development economists, political scientists, and international institutions (i.e., the World Bank and the United Nations) that use GDP growth data to examine cross-national macroeconomic performance differences. We used the Archigos and Worldwide Guide to Women in Leadership datasets to identify the leader’s gender (1=female; 0=male). In this set of analyses, we excluded the queens and only focused on presidents and prime ministers, as the queen’s power is largely symbolic. Our data across the performance and leader variables included 10,340 country/year observations from 1950 to 2004. To measure ethnic diversity at the national level, we used the EF measure introduced above and illustrated in Figure 3. The most ethnically homogenous country in our sample is Comoros (EF=0) and the most diverse is Uganda (EF=0.93). Paraguay represents 1 standard deviation below the mean (EF=0.17), and Senegal represents 1 standard deviation above the mean (EF=0.69). In addition to the diversity measure, we also collected data on the other known correlates of economic growth. Since the 1950s, Solow’s classic economic growth theory predicts that national growth is a function of both physical and human capital inputs. However, more recent studies on cross-national comparative economic growth focus on institutions as the source of variance in national productivity. We also collected data on known covariates that are associated with annual GDP growth rates. The four cross-national comparative measures used to proxy these important factors are the Gapminder population database (size proxy), paved roads (investment rate proxy), post-secondary schooling (human capital proxy) and rule of law (institutional proxy). The combination of these datasets yielded 5,709 leader-year observations from 1950 to 2004, representing 139 of the 188 total countries. Results detailing significant correlations and interactions are revealed across the four models presented in Table 4 (details on the empirical methodology are provided in the appendix). First, we found consistent baseline results that replicate the predicted economic development argument, which suggests that GDP grows at a higher rate in countries with higher investments in infrastructure, human capital and strong rule of law (Model 1). Second, we conducted an empirical test to examine whether there are overall GDP growth rate differences between female and male leaders and found no significant differences (Model 2). On average, male and female national leaders performed equally in Model 1 and Model 2. However, our main curiosity is whether the gender of the national leader matters in comparatively diverse countries. We introduced the EF measure into the empirical test in Model 3 to first establish the known inverse relationship between EF and GDP growth. We replicated this significant finding (p<0.001) found in previous cross-national comparative studies, which demonstrates that EF is a negative correlate of GDP growth. While we make no claims about the causal mechanisms, the directional impact of EF on GDP growth is consistent with the idea that an ethnically diverse country is more difficult to lead than a less diverse country. We then tested the interaction of EF and gender (Model 4) and found a positive and significant (p<0.01) association with GDP growth rate. In other words, this interaction suggests that high levels of ethnic fractionalization account for the biggest difference in GDP growth for male and female leaders. Highly ethnically diverse countries led by a female have a 6.6 percent GDP growth rate in the subsequent year, if the country has extreme ethnic fractionalization (EF=1) (Figure 4). For example in Liberia, one of the most ethnically diverse and difficult to lead countries in our sample (EF=0.91), the predicted GDP growth is 14.55 percent if the leader is female, versus -1.89 percent if the leader is male. Why do women perform better in diverse country contexts? Psychologists point to behavioral correlations to explain why women might be more suitable leaders than men in diverse settings. Several meta-analyses have shown that there are perceptible differences in how men versus women lead in organizations and teams. Laboratory experiments and assessment studies show that women tend to lead with a more participative-democratic style than men. Moreover, the recent biosocial contingency model of leadership suggests that people look for leaders that fit the adaptive problems (e.g., intergroup conflicts) of the situation. For example, people tend to select leaders with more traditionally feminine facial characteristics when the situation warrants a more cooperative intergroup setting. Contrastingly, competitive intergroup settings prompt individuals to choose leaders with a more traditional masculine appearance. For example, in a recent study, Brown et al. (2011) found that when there is a threat and perceived need for change in the environment, people tend to prefer female to male leaders, aligning female stereotypes with change and male stereotypes with stability. These evolutionary psychological explanations suggest that women may be seen as more effective in difficult situations that require more cooperative, inclusionary practices where they can then use their typically more democratic style to navigate. Perhaps these explanations demonstrate why the unique historical context of a given country plays a role in when that country might be most amenable to having a woman lead. Notable contemporary examples include fragile post-war countries such as Liberia with Ellen Johnson-Sirleaf, post-reunification Germany with Angela Merkel, the Korean peninsula as it considers reunification with Park Geun-hye, and countries emerging from the shadow of harsh dictatorships or suppressive regimes, such as Chile with Michelle Bachelet. If these findings are true at the national leader level, perhaps nations, when given the opportunity, will elect female leaders in times of need during the most social strife and conflict. Certainly this appears to be a common theme in the female national leadership examples presented above. Moreover, the complexity and risk of failure that accompanies these environments may make people more open to seeing a woman as an effective leader in such settings. Still another explanation for why women perform well in diverse settings is that their gender role is symbolic of change, therefore empowering other groups that had been previously disenfranchised or marginalized. Studies have shown that the mere presence of a woman in a key leadership position has the power to inspire a new generation of participation and inclusion in key economic areas. This symbolic representation of change, coupled with real shifts in the policy agenda, has the potential to mobilize inclusion in societies that were otherwise constrained. We offer these plausible explanations so as to expand the discussion on the role of gender, diversity and leadership rather than to suggest that these are the only plausible explanations. The scientific inquiry related to this research still has room for further question. Our findings suggest that national environments that have perceived needs for leadership characteristics and role expectations, such as improving perceived inequities, empowering others and inclusiveness, are situations in which female leaders are most effective. In these particularly complex conditions, which call for deep cooperation and collaboration, female leaders outperform their male counterparts. This demonstrated effect is not unique to the national leadership level. Similar evidence has been found in the corporate sector, where the presence of female leaders in the top ranks of U.S. corporations has had a positive effect on performance (i.e., more profitable and innovative), but even more so in complex innovation situations where pro-social behaviors and diverse perspectives are most needed. The combined results of our study and studies of private sector organizations illustrate the magnitude of the challenges and opportunities facing nations and organizations. Although women represented about half of the world’s population, in the 188 countries we covered from 1950 to 2004, women comprised less than a miniscule 5 percent of national leaders. These small ratios are also prevalent in the private sector. While the pipeline of women in managerial positions has dramatically increased from 18 percent in 1972 to 45 percent in 2000 in the U.S. labor force, and women currently represent almost 15 percent of the executive officers and board directors in the Fortune 500 (top U.S. firms) and the Financial Post 500 (top Canadian firms), females still only represent 1 percent of CEOs in these corporations. On average, national parliaments around the world are comprised of less than 15 percent women, and these positions fuel the pipeline for possible future female national leaders. Perhaps long-term sustained efforts, such as consociationalism, that guarantee equitable representation of all groups—whether gender, ethnic or otherwise—in the top leadership of a society could stimulate inclusion, participation and economic advancement in otherwise fractionalized societies. While this study advances our understanding of the correlation between female national leaders and ethnic diversity, we are merely beginning to uncover the myriad of questions regarding the national role of female national leaders. Potential future research questions include: What factors influence female national leaders in consideration for election? What roles do country-level quotas for parliamentary positions play in improving the pipeline for female national leaders? What other national-level outcomes might be positively associated with female leaders (e.g., reduced corruption and conflict)? All of these are questions that would help us better understand the unique role women play in the global economy. Figure 1. How female national leaders obtained position. 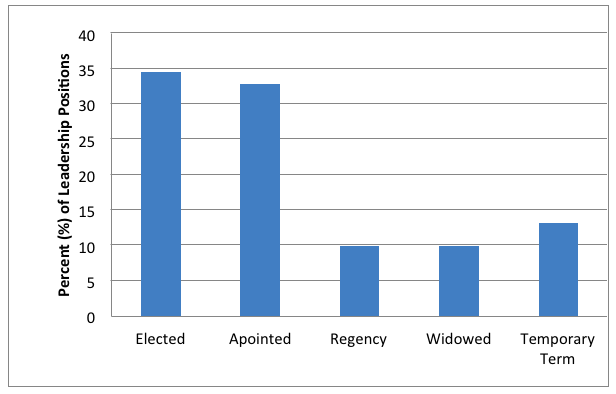 While the majority of female leaders came into power through appointment or election (67%), the remainder of the female national leaders were granted power to govern through regency, fatality of their spouse and other temporary appointments. Figure 2. Number of female national leaders per year. Since 1950, national female leaders have more than quadrupled by 2004. The increase of women’s leadership presence globally has been in elected and appointed presidential and prime ministerial positions. Most recently in 2004, the greatest share of female leadership around the world is represented by presidential position (50%). Source: Data obtained from “Archigos: A Data Set on Leaders 1875-2004,” Version 2.9 (13 August 2009) and the “Worldwide Guide to Women in Leadership,” (2011). Figure 3. Ethnic fractionalization (EF) in selected nations. EF is a country-level index measure of ethnic diversity designed to capture the number of ethnic groups in a society. High levels of EF correspond to a value of 1; low levels correspond to a value of 0. In our sample of 188 nations, the mean EF is 0.43. Source: Data obtained from Alesina et al. (2003). Figure 4. Ethnic fractionalization, national leader gender, and GDP growth. Female led countries with high levels of EF, have increasingly higher GDP growth rates in these complex situations relative to male leaders. 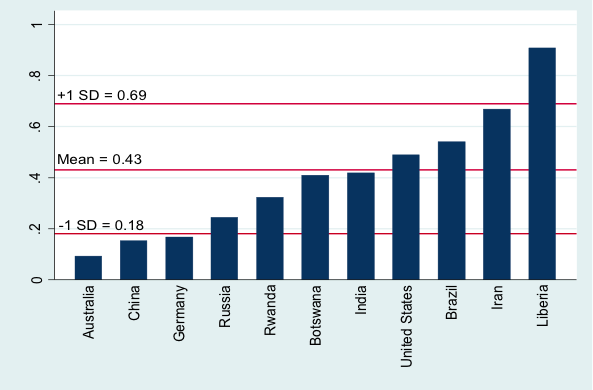 In highly fractionalized countries (EF=1), female leadership is correlated with a 6.6% GDP growth. Male leaders outperform the average growth rate in more homogenous countries. Source: Data for EF obtained from Alesina et al. (2003); data for leader’s gender obtained from “Archigos: A Data Set on Leaders 1875-2004,” Version 2.9 (13 August 2009) and the “Worldwide Guide to Women in Leadership,” (2011). *Only presidents and prime ministers are included; not queens. Models 1 to 4 were estimated using OLS regression with a one-year performance lead. The analyses were conducted in Stata statistical programming package version 12.1. Population data was log transformed to address the right skewed distribution of the variable. Additional robustness checks were conducted using the GDP growth rate two-year time lead (GDP year +2), GDP growth year and time lags (GDP year -1, -2) to capture the period before, during and after the leader took office. Observing this five year window around the leader’s entry assists to rule out alternative explanations for inherited regimes performance (GDP year -1, -2) and continuity of current leader’s performance (GDP year +2). We find both the GDP year and two year lead produces mostly consistent results. Replicating the models using the lagged variables, we find no significant interaction effects between gender of the leader and the ethnic diversity measure (EF). Additionally, the Fearon et al. ethnic diversity measure is tested in lieu of the Alesina et al. EF measure and the results remain the same. We further tested the robustness of the model by trimming GDP growth year outliers, which potentially could skew the data relative to other leadership years. Year and country fixed effects were also included. We tested all models including annual GDP per capita as a baseline. Results remained consistent for all of these robustness checks. Alberto Alesina, Arnaud Devleeschauwer, William Easterly, Sergio Kurlat and Romain Wacziarg, “Fractionalization,” Journal of Economic Growth 8, no. 2 (June 2003), 155-194. Alice H. Eagly, Mary C. Johannesen-Schmidt and Marloes L. van Engen, “Transformational, Transactional, and Laissez-Faire Leadership Styles: A Meta-Analysis Comparing Women and Men,” Psychological Bulletin 129, no. 4 (2003), 569-591; Alice H. Eagly and Blair T. Johnson, “Gender and Leadership Style: A Meta Analysis,” Psychological Bulletin 108, no. 2 (1990), 233-256. “Profile: Liberia’s ‘Iron Lady’,” BBC News, 23 November 2005, http://news.bbc.co.uk/1/hi/world/africa/4395978.stm; Eduardo Gallardo, “Two women leading presidential polls in Chile, raising prospect of first female leader,” Associated Press, 18 March 2005; Evan Ramstad, “Korean Political Heiress Seeks Presidency; Ex-Leader's Daughter, Seeking to Be First Woman President, Joins Race as Front-Runner,” Wall Street Journal, 10 July 2012. Our point with these two examples is to distinguish them as prime ministers who were elected rather than appointed, as were Sirimavo Bandaranaike and Indira Ghandi of Sri Lanka and India, respectively. The full Archigos data set can be found at: Henk E. Goemans, Kristian Skrede Gleditsch and Giacomo Chiozza, “Archigos: A Data Set on Leaders 1875-2004,” Version 2.9 (13 August 2009), http://www.rochester.edu/college/faculty/hgoemans/Archigos.2.9-August.pdf. See Henk E. Goemans, Kristian Skrede Gleditsch and Giacomo Chiozza, “Introducing Archigos: A Dataset of Political Leaders,” Journal of Peace Research 46 no. 2 (2009), 269-283; Martin K. Christensen, “Worldwide Guide to Women in Leadership,” (2011), http://www.guide2womenleaders.com/. We follow the general coding rule established in the Archigos database. In Parliamentary regimes, the effective leader is the Prime Minister, and in Presidential systems, the President. In Communist States, the Chairman of the Party is generally coded as the effective leader. In Table 1, for simplicity, we list the few leaders that fall into this latter category as Presidents. We used both the “Archigos: A Data Set on Leaders 1875-2004,” Version 2.9 (13 August 2009) and the “Worldwide Guide to Women in Leadership,” (2011) to compile this list of female national leader terms. Timothy Besley, “Political Selection,” Journal of Economic Perspecives 19, no. 3 (Summer 2005), 43-60; Benjamin F. Jones, “national leadership and economic growth,” in New Palgrave Dictionary of Economics, ed. Steven N. Durlauf and Lawrence E. Blume (Palgrave Macmillan, 2009), http://www.dictionaryofeconomics.com/article?id=pde2009_N000171; Benjamin F. Jones and Benjamin A. Olken, “Do Leaders Matter? National Leadership and Growth Since World War II”, Quarterly Journal of Economics 120 no.3 (2005), 835-864. Benjamin F. Jones, “national leadership and economic growth,” in New Palgrave Dictionary of Economics, ed. Steven N. Durlauf and Lawrence E. Blume, Palgrave Macmillan, 2009, online edition, http://www.dictionaryofeconomics.com/article?id=pde2009_N000171; Jones and Olken, (2005), 835-864. See Jones and Olken (2005), 849, Figure 1, for a visual illustration of China’s growth patterns under the two administrations. Eagly, Johannesen-Schmidt and van Engen (2003), 569-591; Eagly and Johnson, (1990), 233-256. Alberto Alesina et al., (2003), 155-194; Alberto Alesina and Eliana La Ferrara, “Ethnic Diversity and Economic Performance,” Journal of Economic Literature 43 no. 3 (Summer 2005), 762-800; Paul Collier, “Ethnicity, Politics and Economic Performance,” Economics & Politics 12 no. 3 (November 2000), 225-245; William Easterly and Ross Levine, “Africa's Growth Tragedy: Policies and Ethnic Divisions,” Quarterly Journal of Economics 112 no. 4 (November 1997), 1203-1250; James D. Fearon, “Ethnic and Cultural Diversity by Country,” Journal of Economic Growth 8 no. 2 (June 2003), 195-222; James Fearon, Kimuli Kasara and David Laitin, “Ethnic Minority Rule and Civil War Onset,” American Political Science Review 101 no. 1 (February 2007), 187-193; Ted Gurr, “Minorities at Risk Dataset”, (Center for International Development and Conflict Management, University of Maryland, College Park, MD: 1996). Alberto Alesina et al., (2003), 155-194. Alberto Alesina, Reza Baqir and William Easterly, “Public Goods and Ethnic Division,” Quarterly Journal of Economics 114 no. 4 (November 1999), 1243-1284; Easterly and Levine (1997), 1203-1250; Alesina and La Ferrara, (2005), 762-800. Alesina et al., (2003), 155-194; Easterly and Levine (1997), 1203-1250. Alesina et al., (2003), 175. 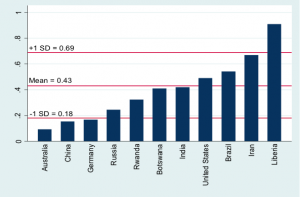 Growth is calculated as the annual growth rate of Real GDP per capita in constant year 2000 prices. Alan Heston, Robert Summers and Bettina Aten, “Penn World Table Version 6.3” (Center for International Comparisons of Production, Income and Prices, University of Pennsylvania: 2009), https://pwt.sas.upenn.edu/php_site/pwt_index.php. Jones and Olken, (2005), 835-864. Following the definition used in the Archigos database codebook (Henk E. Goemans, Kristian Skrede Gleditsch and Giacomo Chiozza, “Introducing Archigos: A Dataset of Political Leaders,” Journal of Peace Research 46 no. 2 (2009), 269-283), we identify the “effective primary ruler” (which often corresponds to the head-of-government) as the national leader—in Parliamentary systems the Prime Minister is coded, in Presidential systems the President is coded, in Communist states (generally) the party leader is coded. For those countries not covered in the Archigos database, we used the Worldwide Guide to Women in Leadership website, which lists presidents and prime ministers from 1950 to 2011. Our national leader variable is coded 0/1 for gender (0 = male, 1 = female). See Martin K. Christensen, “Worldwide Guide to Women in Leadership,” http://www.guide2womenleaders.com/. Eagly and Johnson (1990), 233-256. Robert M. Solow, “A Contribution to the Theory of Economic Growth,” Quarterly Journal of Economics 70, no. 1 (February 1956), 65-94. Daron Acemoglu, Simon Johnson and James A. Robinson, “Institutions as the Fundamental Cause of Long-Run Growth,” in Handbook of Economic Growth Volume 1a, ed. Phillipe Aghion and Steven Durlauf, (Amsterdam, Elsevier, 2005), 386-472. See Robert Barro and Jong-Wha Lee, “International comparisons of educational attainment,” Journal of Monetary Economics 32 (1993), 363-394 and Robert Barro and Jong-Wha Lee, “A New Data Set of Educational Attainment in the World, 1950-2010,” (Working Paper 15902, National Bureau of Economic Research, Cambridge, MA: 2010), 1-47, http://www.nber.org/papers/w15902.pdf for human capital data on years of schooling; Mattias Lindgren Documentation for Total Population for Countries and Territories (Gapminder Foundation, Stockholm, 2008) for population data; “Rule of Law” (Freedom House, Washington, DC, 2006) for Rule of Law data; “World Development Indicators” (The World Bank, Washington, DC: 2011) for infrastructure data on paved roads. Unavoidable data reduction is primarily due to the lack of country coverage on the Barro and Lee (2010) years of schooling measure, which covers 146 countries. See Acemoglu, Johnson and Robinson (2005), 386-472 for an overview of institutions and economic growth; See Barro and Lee (1993), 363-94 and Barro and Lee (2010), 1-47, http://www.nber.org/papers/w15902.pdf for human capital data on years of schooling; See Mattias Lindgren Documentation for Total Population for Countries and Territories (Gapminder Foundation, Stockholm, 2008) for population data; See Freedom House, Washington, DC (2006) for Rule of Law data; See “World Development Indicators” (The World Bank, Washington, DC: 2011), for infrastructure data on paved roads. Alesina et al., (2003), 166. Eagly and Johnson (1990), 233-256; Alice H. Eagly, Mona Makhijani and Bruce G. Klonsky, “Gender and the Evaluation of Leaders - A Meta-Analysis,” Psychological Bulletin 111, no. 1, 3-22. Brian R. Spisak, Astrid C. Homan, Allen Grabo and Mark Van Vugt, “Facing the situation: Testing a biocontingency model of leadership in intergroup relations using masculine and feminine faces,” Leadership Quarterly 23, no. 2 (April 2012), 273-280. Elizabeth R. Brown, Amanda B. Diekman and Monica C. Schneider “A Change Will Do Us Good: Threats Diminish Typical Preferences for Male Leaders,” Personality and Social Psychology Bulletin 37, no. 7 (5 April 2011), 930-941. S. Alexander Haslam and Michelle K. Ryan, “The Road to the Glass Cliff: Differences in the Perceived Suitability of Men and Women for Leadership Positions in Succeeding and Failing Organizations,” Leadership Quarterly 19, no. 5 (October 2008), 530-546; S. Alexander Haslam and Michelle K. Ryan, “The Glass Cliff: Evidence that Women are Over-Represented in Precarious Leadership Positions,” British Journal of Management 16, no. 29 (February 2005), 81-90. Lori Beaman, Esther Duflo, Rohini Pande and Petia Topalova, “Female Leadership Raises Aspirations and Educational Attainment for Girls: A Policy Experiment in India,” Science 335, no. 6068 (February 2012), 582-586. For changing voter attitudes see Lori Beaman, Raghabendra Chattopadhgay, Esther Duflo, Rohini Pande and Petia Topalova “Powerful Women: Does Exposure Reduce Bias?” Quarterly Journal of Economics 124, no. 4 (November 2009), 1497-1540. For leadership quotas see Drude Dahlerup, ed. Women, Quotas and Politics (New York: Routledge, 2006). For psychological explanations, see Spisak, et al., (2012), 273-280. Roy D. Adler, “Women in the Executive Suite Correlate to High Profits,” Harvard Business Review 79, no. 3(2001), 131-137; Cristian L. Dezsö and David G. Ross, “Does Female Representation in Top Management Improve Firm Performance? A panel data investigation,” Strategic Management Journal 33, no. 9 (September 2012), 1072-1089. Peggy M. Lee and Erika Hayes James, “She'-E-Os: Gender Effects and Investor Reactions to the Announcements of Top Executive Appointments,” Strategic Management Journal 28, no. 3 (March 2007), 227-241; Marianne Bertrand and Kevin F. Hallock, “The Gender Gap in Top Corporate Jobs,” Industrial and Labor Relations Review 55, no. 1 (October 2001), 3-21; “Women ‘Take Care,’ Men ‘Take Charge:’ Stereotyping of U.S. Business Leaders Exposed (New York: Catalyst, 2005) http://www.catalyst.org/knowledge/women-take-care-men-take-charge-stereotyping-us-business-leaders-exposed. World Bank Gender Statistics (2011). Arend Lijphart, Democracy in Plural Societies: A Comparative Exploration, (New Haven: Yale University Press, 1977), 1-9. Leader positions and term lengths are obtained from “Archigos: A Data Set on Leaders 1875-2004,” Version 2.9 (13 August 2009) and the “Worldwide Guide to Women in Leadership,” (2011). We used the Archigos data code book to define the leader position definitions for each country. Country classifications of developed, developing and least developed nation status were adopted from the United Nations classification system. “Stata Statistical Software: Release 12” (College Station, TX: StataCorp LP, 2011). Using GDP year, Table 4 results are replicated for all models except model 6 where the Gender X difficulty interaction is not significant. Using lead +2, Table 4 results are replicated for all models. Fearon, Kasara and Laitin, (2007), 187-193; Alesina et al. (2003), 155-194. From 1950 to 2004, there were six observations across four countries (Equatorial Guinea, Ghana, Iraq and the United Arab Emirates) that had GDP growth rates greater than 100 percent and less than negative 50 percent in a year (e.g., Equatorial Guinea grew 126% in 1997 due to oil discoveries in the Atlantic Ocean).